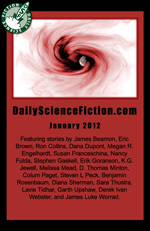 Daily Science Fiction is a popular, professional venue for both science fiction and fantasy. Unlike other online professional magazines, we email stories to our subscribers each weekday. This provides a unique opportunity to reach a set group of dedicated genre readers on their "home turf," in their inbox, where they've invited us to share. In our fourth year, we have already published more than 1,000 stories. Daily Science Fiction is an established and reliable place for fans to find top names in the field and exciting new authors. The Daily Science Fiction website gets about 90,000 page views every month, reaching 15,000 unique readers. Our email subscriber list is 9,000.